We left Skagway around 2:00p.m. on Sunday. Monday morning we had to return the RV so we wanted to reach Whitehorse by late Sunday afternoon. It is about a 180 km drive. The idea was to drive straight through without stopping and then to do day trips from Whitehorse on Tuesday and Wednesday to visit Carcross and the surrounding area. 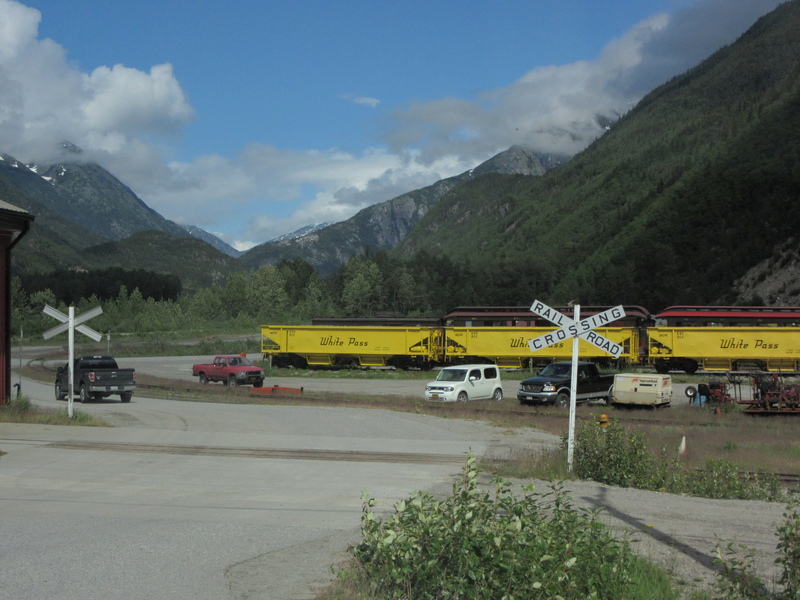 We passed the rail yards of the historic White Pass and Yukon railway (WP&Y) and left Skagway behind us. Built during the Klondike Gold Rush, the narrow gauge WP&Y railroad is an International Historic Civil Engineering Landmark, a designation shared with the Panama Canal, the Eiffel Tower and the Statue of Liberty. 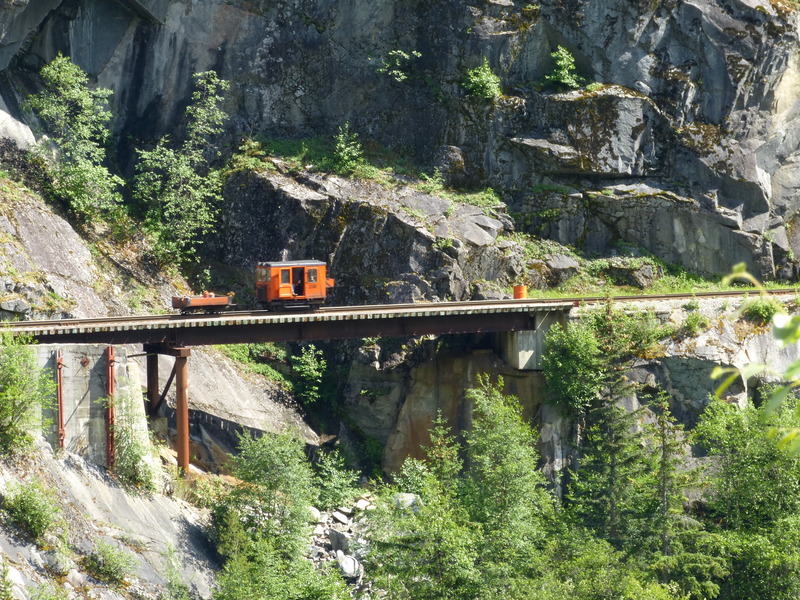 The 110 mile WP&YR Railroad was completed on July 29, 1900 in connecting the port of Skagway Alaska to Whitehorse. For over eighty years the railway brought goods and people into the remote Yukon. Today it is a seasonal tourist operation popular with the Alaska cruise ship passengers providing spectacular views of the wilderness and inspiring a real sense of admiration for the courage of the early Klondikers who crossed these mountain passes on foot. 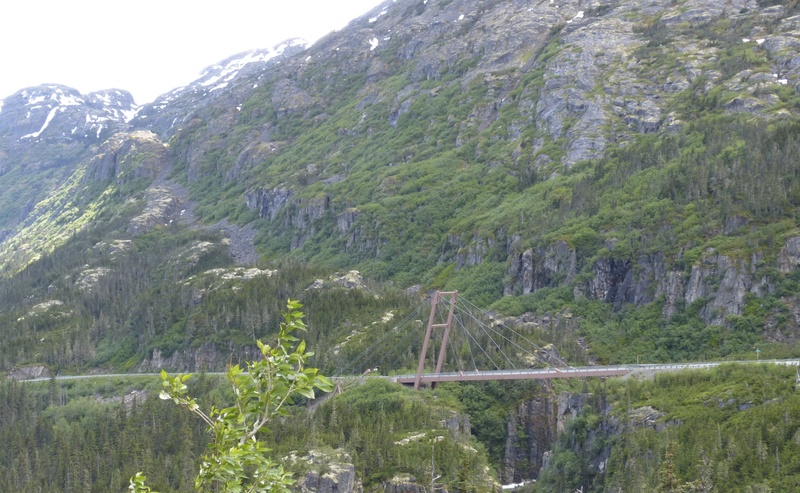 We crossed the bridge over the ice blue Skagway River and immediately we started to see the surrounding mountains. The road started to climb and within a few minutes we were at a pullout. 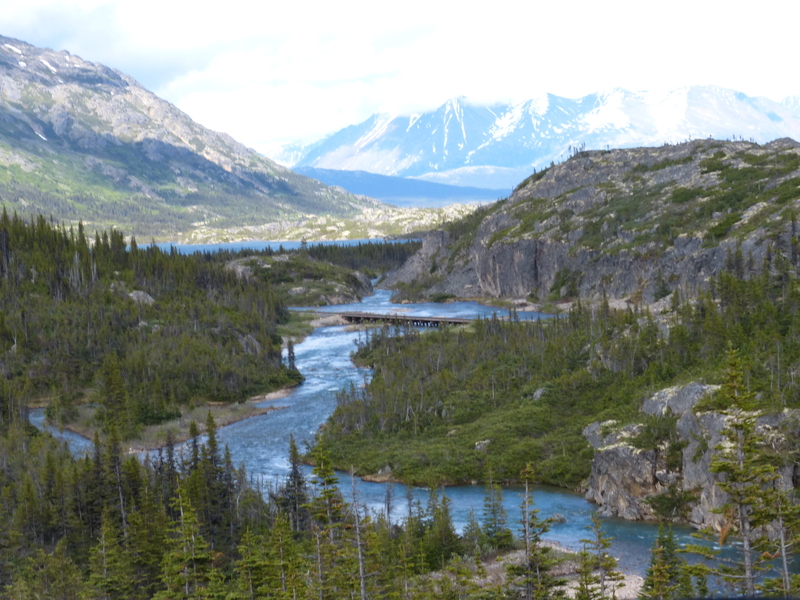 There was an amazing view of the East Fork of the Skagway River and Rocky Point on the opposite side of a lush green gorge. We stopped to have our lunch and enjoy that view. We watched an orange railroad maintenance car passing over a railway trestle. The rocky mountain crags rising behind it make it seem like a toy. The speed limit on the road up to White Pass and the US Border stop is 35 miles per hour (50km/hr). But you do not want to be driving any faster. It is one stunning view after another and luckily there are a number of pullouts to stop and take in the views. The Tlingit people had used the White Pass as a trading route far back into the mists of time, and when gold was discovered in the Klondike in 1896, it and the Chilkoot Pass, just to the west, became the main trails for the mad rush to the goldfields (A lot of the rest of the info below is also from An Explorer’s Guide to the South Klondike HighwaySkagway to the Alaska Highwayby Murray Lundberg). We crossed the William Moore Bridge, an asymmetrical cable-stayed suspension bridge, that crosses a very active earthquake fault. It is only firmly anchored on the downhill side so that it can move freely with the earth. The gorge that the bridge crosses is only 110 feet wide, but 180 feet deep (the bridge deck is about 250 feet long). Captain Moore was a steamboat captain and the first settler in Skagway. 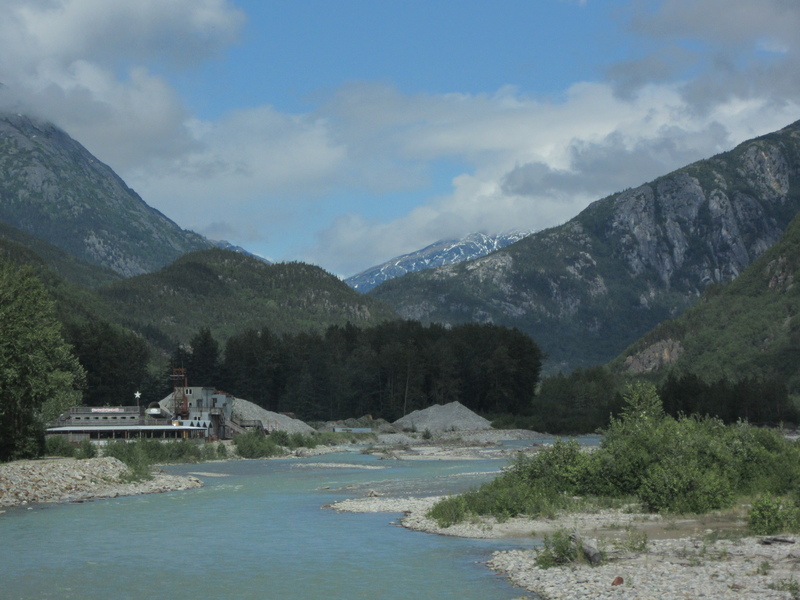 We pulled off the road again to the views down the Skagway River Valley, with the Cleveland Glacier above the Moore Bridge and the Sawtooth Mountains. At the “Welcome to Alaska” sign you look towards the White Pass (summit of the White Pass, 3,292 feet ) and the Sawtooth Mountains. You cross back into the Yukon at the Canada Customs post at Fraser. It is a good hour drive from the American border check-point for entry into Alaska. There is a red building by the lake – the last water tower remaining on the WP&YR line from the days when steam locomotives were used. We were asked the usual questions about firearms , did we have any alcohol and what we had purchased while in the US. I had not thought about it but we were only in the US for one night so in theory we would not have been able to bring anything back with us into Canada. I did let him know that we had bought a bottle of wine in Haines and we had not finished it, And he was Ok with that. He wanted to know when the capogita was going back to Italy. All Ok there too, as he has a return airplane ticket! Then we chatted with Border Services officer. We asked what he had to do to get this posting in such a beautiful location. He said that all he had to do was ask. He and his wife were from Vancouver and they came back every summer. He said he gets up every morning and can’t believe how lucky he is to see this view! 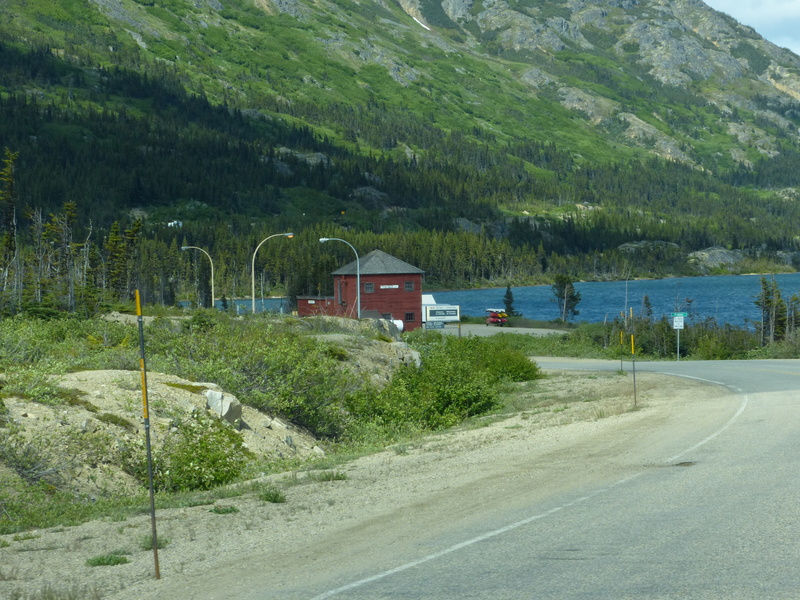 The highway starts following the Tutshi River (pronounced TOO-shy) and then the Tutshi Lake for almost 16 km. The lake sits at an elevation 707 meters and was the most incredible shade of royal blue. At one point there was a pullout with a clear view of the snow streaked Mount Racine across the lake. In the next 50 km there were a half-dozen large pullouts with incredible views. We had intended to drive straight through from Skagway to Whitehorse but it was just impossible not to stop at every pull-out! We stopped at the Bove Island viewpoint . It has a view down Tagish Lake which flows into the Yukon River. From the interpretive signs we leaned that during the Gold Rush, many boats were wrecked here as they came out of calm Nares Lake into high winds on Windy Arm. Bove Island was named by Frederick Schwatka for Lt Giacomo Bove an officer in the Italian Royal Navy who was an explorer and expert on ocean currents. We reached Emerald Lake, with its distinctive green waters it is apparently the most-photographed lake in the Yukon. At that point we were I would say almost shell-shocked from the incredible scenery and change in scenery we had experienced in one day. We had watched the American eagles soaring over the misty Lynn Canal; we saw the lush green forests while on the ferry ride along the Lynn Canal to Skagway; then the sun came out and we saw the colorful buildings of Skagway with a back drop of snow-capped mountains; then the windswept rocky outcroppings before reaching the Yukon border and finally the incredible blue waters of the lakes and rivers with a back drop of mountains. Now as we were about 50 km from Whitehorse we were feeling like there could not possibly be anymore stunning things to see. But no. Some cars were stopped on the highway ahead of us. We slowed down and yes there was a bear along side the road. 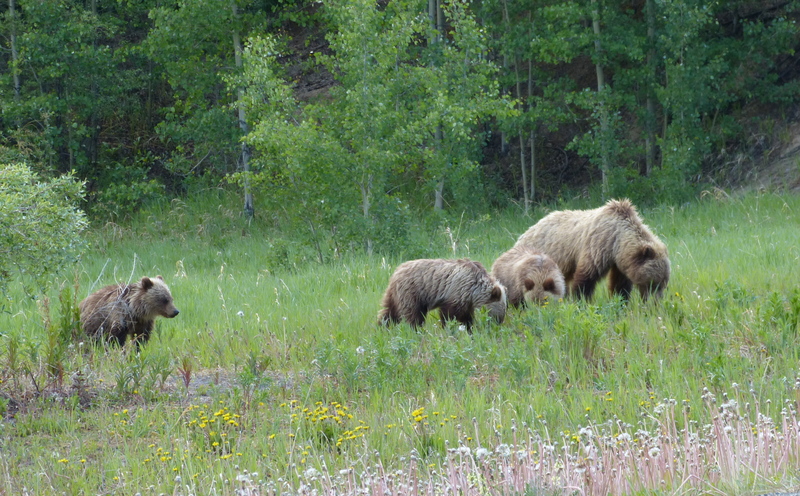 But wait, not one bear, four bears – a mother grizzly with three cubs. The mother was a golden brown color and her cubs were all different shades of chestnut-brown. It was like watching a National Geographic Wildlife film. We watched for a good 20 minutes. The cubs were playful, wandering here and there, grazing on the wildflowers under the ever watchful eyes of the mother. It was the cherry on top of the sundae feeling – the perfect ending to our RVing journey! Beautiful piece, as usual. I seem to notice that you are entering a competition with Jenna Schnuer, whose piece on bears in Alaska (Brooks Camp) just happened to appear in the weekend isuue of the Into NY Times (Aug 8-9). But yours is better!